Hey guys! (I know it’s not spring, shhh let’s just pretend shall we) As many of you may know, I (fairly recently) started doing the Down the TBR Hole meme, in which you go through 5-10 books on your TBR and decide whether to keep them or let them go. As I started with about 700 books on my TBR (and continue to add more as I go, argh), I definitely deemed this idea necessary for me. However, with 700 books to get through and only doing ten per week, I’m sure you can do the math- that’s a long time (70 weeks) and it’ll be even longer as I’ve already added extra books and I’m sure that won’t stop. So I figured, why not try to get rid of a few extra? Whoo-wee, are there a lot of these! I know, I know, people always say not to judge books by their covers, but I think we all do a little bit, right? Right? Riiiiiight? Now of course, there are plenty of books with not-so-great covers that have awesome stories inside, so I decided to pick out all of my least favorite covers from my TBR and get rid of the ones that have equally disinteresting blurbs (in my opinion). Here goes! Mystic and Rider by Sharon Shinn- I honestly have no recollection of adding this to my TBR, I have no idea why I would, and I have no interest in keeping it there! Also, it is SUCH a huge pet peeve of mine when author’s names are bigger than the title. Urgh! Crash by Nicole Williams- This looks like a typical bad boy-good girl New Adult relationship, and I’m not sure where I would’ve found it in the first place, let alone why I would’ve added it to my TBR. Wasteland by Susan Kim & Laurence Klavan- The premise almost sounds interesting, but this has HORRIBLE ratings and reviews. Yikes! Possess by Gretchen McNeil- The blurb sounds like every paranormal YA ever? No thanks. 18 Things by Jamie Ayres- This book sounds like it actually might be problematic, and apparently, the author actually included quotes and discussion questions at the end of each chapter. Not the book, EVERY CHAPTER. Whaaaaat? Not okay. Flip by Martyn Bedford- This book sounds like it could be interesting, but the blurb is really short and not all that exciting, and it appears to have really low ratings. And I mean, look at the cover! MY EYES ARE SCARRED. Hourglass by Myra McEntire- This cover always looks really awkward and makes me think she’s pregnant (as far as I know, she isn’t), and the one person I know who’s read this book hated it. So… No thanks! Beautiful Malice by Rebecca James- This book sounds stereotypical and not all that exciting. I don’t see a reason to keep it! How to Be Bad by E. Lockhart, Sarah Mlynowski, & Lauren Myracle- This book is also rated rather low on Goodreads! It doesn’t look bad, just not all that interesting. On the Edge by Allison van Diepen- Good girl falling for (extremely) bad boy? In my opinion, this trope is overused, and when it is used in books, it shouldn’t be the main focus. Bewitching by Alex Flinn- I’m honestly not sure whether I’ve actually already read this book. As I mentioned in a recent Down the TBR Hole, I read some of Alex Flinn’s books a few years ago. However, I don’t remember exactly which ones, and if I ever decide to get into them again, I need to read them all from the beginning. For now, I just don’t think it’s necessary to keep this on my TBR. Frost by Marianna Baer- Again, this one doesn’t sound bad, it just doesn’t sound amazing either. I think I’ll pass for now. A Certain Slant of Light by Laura Whitcomb- I mean, she’s dead and he’s not and there’s a romance thing? But at the same time, I just don’t see myself getting to this one anytime soon, and it doesn’t make sense to keep it on. The Naming by Alison Croggon- I’m not actually disinterested in this one, but I’m not all that excited about it either, and I haven’t really heard anything about it from the bookish community. Firelight by Sophie Jordan- “The only bright light is Will. Gorgeous, elusive Will.” I don’t know anyone who’s read this (good or bad) and I don’t think I need that romance in my life! 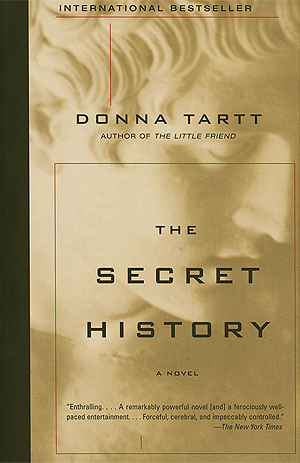 The Secret History by Donna Tartt- This is the last one! I just have no idea why I added this to my TBR in the first place, so I don’t have a reason to keep it there any longer. The Crown by Kiera Cass- I specifically said The Crown instead of The Selection series. Because I read The Selection series. And it was a trilogy. And I loved it! And then Kiera Cass decided (for some horrible reason) that a fourth book should exist. I read The Heir. I hated it. At this point, I’ve come to terms with the fact that I’m just not going to read The Crown. I don’t care about this little “miniseries” she tacked on to the end of a perfectly good trilogy, and I’d like to keep it as a trilogy in my mind. To be honest, I’m not sure why I still have this one on my TBR. I Am Number Four by Pittacus Lore- This book looks interesting, but it is a LONG series, and I just don’t think I have that kind of stamina. If I were to read this book, I would probably end up actually reading the first couple and never getting around to the rest. It just doesn’t make sense to start something I won’t ever finish. The Waterfire Saga by Jennifer Donnelly- I read Deep Blue (the first book in this series) a couple of years ago and enjoyed it. Then the sequel came out and I meant to read it but I didn’t get around to it for a while. And then I blinked and there were four books in the series. I liked the first book, but I wasn’t absolutely infatuated with it and I’m just not invested enough to catch up on what I’ve missed and read a new installment every six months. The Maze Runner series by James Dashner- To be honest, I actually watched the Maze Runner movie before I read the book. I swear I don’t do that often! When I finally did get around to the book, I liked it well enough, but I actually think I liked the movie better (even though they were different stories and therefore completely separate entities). I’ve also been hearing a lot lately that after the first book in this series, it just goes downhill. Most people don’t seem to like the ending of this series, and I don’t see a point in investing my time in it. I’ll probably (don’t hate me) watch the rest of the movies though, because the concept is still interesting, and my dad and I are always looking for sci-fi movies to watch together! The Fifth Wave series by Rick Yancey- I actually checked this book out from the library and started to read it. And… Didn’t get very far. I just couldn’t get into this one. The premise is intriguing but not the MOST exciting thing ever, and I think I can live without reading these books. I’ve also heard that the ending to this series is unsatisfactory as well. However, I’ll also probably watch these movies. The Legacy Girls series by Augusta Blythe- Damsel is actually the first book in this series, but there is a (full-length book) prequel to the series, called The Legacy Girls: A Prequel, which I actually read and quite enjoyed. I picked it up for a free ebook challenge and I’m glad I did, but I don’t have any motivation to continue on with the series, so I think I’ll leave the series on that note. Sometimes (especially when I’m in reading slumps) I tend to start a bunch of books and not finish them, but sometimes I get rather far in those books. Usually I give them another shot because I didn’t DNF them because I hated them, but rather due to needing to return them to the library or just not feeling that particular genre. If that makes any sense. But sometimes it’s because I genuinely can’t make it through a book, and I’m hoping to weed a couple of those out here. Shiver by Maggie Stiefvater- Don’t get me wrong, I’ve read The Raven Boys (also by her) and absolutely LOVED it (although I haven’t gotten a chance to finish the series yet). But I checked this book out from the library AGES ago. And gave it SUCH A HUGE CHANCE. But I just couldn’t make it all the way through. I thought I might reread it sometime, but I think that’s just an unrealistic and unfair expectation for myself, so I might as well take it off of my TBR and make room for some of her other books! The In-Between by Barbara Stewart- I actually used this book a little while back for a bookstagram tag of “best first sentences” or something along those lines. I loved how this book started, and was immediately hooked, so I decided to pick it up soon after. However, it wasn’t anything like I expected, and I just felt like I was drowning in the writing style. Still, I own it, and I want to make sure I give it enough of a chance. I think I’m going to delete it off of my Goodreads TBR and consider getting rid of my physical copy. For this one, I just used the Goodreads feature to find any duplicates of books I might have. Radio Silence by Alice Oseman- For whatever reason, Goodreads thought I had both read and wanted to read this book. I do want to read it, but I haven’t been lucky enough to get my hands on a copy yet! Double Crossed by Ally Carter- Somehow, I had it in there twice that I wanted to read this book. I Am Malala by Malala Yousafzai- I somehow managed to add both the regular version of this book as well as the young reader’s edition. I’ll be keeping the regular edition, as I’m still quite interested in reading this one! I didn’t want to say a genre you hate, because I don’t really “hate” any genres, and if I did, I most certainly wouldn’t put them on my TBR. But I do have a couple of genres that I don’t read as much because I just have a harder time getting through them, etc., such as sci-fi and non-fiction. Oh, the places you’ll go! by Dr. Seuss- It’s not that I don’t like children’s books, but this one is really short, I’ve read it before, and I don’t have a need for it on my TBR. I’m honestly not sure how it got there in the first place! Confess by Colleen Hoover- I don’t NOT like new adult, but it isn’t always my favorite, and as I already have other Colleen Hoover books on my TBR, I really don’t need this one too. Not Quite What I Was Planning: Six-Word Memoirs by Writers Famous and Obscure- This is one of those books that’s put together of little snippets by a bunch of different people. It’s interesting, but I don’t think I really want to read a whole book about them, and right now it’s just cluttering up my TBR. And that’s the first half of the Spring Cleaning tag! I started this tag with 693 books on my TBR, and I am now at 664. That’s 29 books. 29!!! And I’m only halfway through! That cover one was a doozy. Anyhoo, I’m really happy with how this post went! I thought about tagging people but (A) I haven’t even finished the tag yet and (B) I don’t have any idea who needs/wants to cut down on their TBR! However, if you are one of those people, feel free to pick this up! Just credit Lala, as she is the creator. And let me know in the comments if you enjoyed this! Toodooloo! 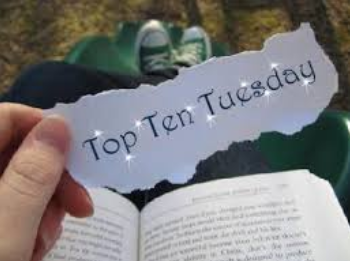 ‹ PreviousDown the TBR Hole: And another one bites the dust! Next ›How to get out of a reading slump: A guide from a recently recovered bookworm!